The Rubbermaid Commercial Utility Cart with Zippered Yellow Bag collects waste and transports tools efficiently on 8" non-marking wheels and 4" casters. This versatile utility cart has 3 lipped shelves, and a zippered yellow vinyl bag for collecting refuse or launderable items. 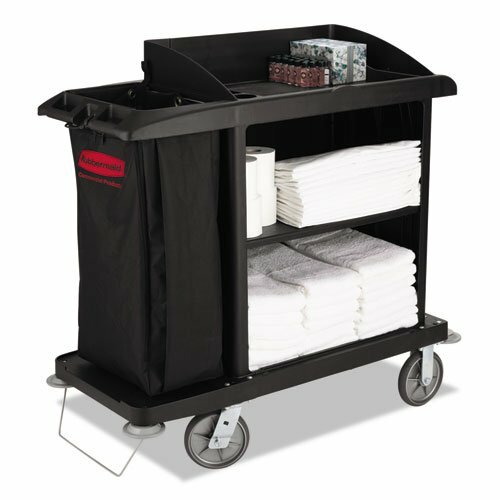 The surface of the top shelf features tool grips for keeping frequently used items at hand wherever this service cart travels. Color: Black; Caster/Glide/Wheel: Two 8" TPR Fixed-Position Wheels; Two 8" TPR Swivel Casters; Material(s): Structural Foam; Overall Width: 22".